The March 2008 issue of Wine & Vines reports three stories of how global forces are pushing up the cost of making wine in the United States. They make interesting reading for anyone interested in how the wine industry is changing today. 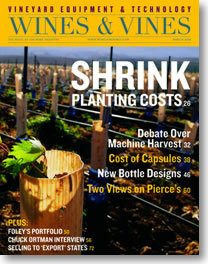 The first article examines the rising cost of planting new vineyards. Environmental concerns are causing winegrowers to substitute steel posts and stakes for the old treated wood products that have been used for years. Steel makes the vineyard greener, but it is now pushing the vineyard bottom line into the red because the cost of posts and wire has been pushed up by surging demand in for steel in China. Once the vineyards are planted the vines need to be pruned and the grapes harvested. This is normally a pretty labor-intensive process but machine alternatives exist and the technology has improved considerably over the last 20 years, according to a second article in the magazine. Winemakers are laying out vineyards with wider spacing to accommodate mechanical pruning and harvesting. This is partly because of rising labor costs in the United States and partly because unreliable federal immigration policy makes access to foreign vineyard workers uncertain. High end winemakers may be willing to pay up to $750 per acre for careful hand harvesting, but many others are willing to employ machinery for a cost per acre of $70 to $250 (plus the $150,000 – $250,000 cost of the machine). The cost difference is significant, of course, but my sense is that this trend would be much weaker if federal immigration policy were more stable and industry-friendly. Winemakers are being squeezed everywhere — input costs, labor conditions and even on the cost of the capsules that protect the cork and decorate the bottle top. High end wines often use imported tin capsules for their sleek and beautiful appearance. But their cost is being pushed up in three ways. First, the price of the raw material – tin – has soared due to high demand in China, where it is used to solder electronic connections. Tin sold for $3600 a ton in 2002 and $6600 in 2005. It costs $16,500 a ton today due to the China effect and speculation associated with it. This huge increase is necessarily reflected in rising capsule prices. But wait, there’s more. Rising oil prices and demand for shipping container space has helped push up the cost of shipping tin capsules from Europe by 27 percent. The third and final factor is the falling dollar, which makes everything from Europe more expensive. Much more expensive, given the dollar’s recent collapse. Winemakers are having to consider how much a tin capsule adds to their wine’s image, since it is obviously taking from, not adding to, the bottom line. Global market forces (steel, oil, tin, shipping costs, exchange rates) and the government policies that try to contain them (think immigration) are squeezing winemakers in many ways. It will be interesting to see how much the industry is transformed by these effects.